Jen Rork creates her evocative seascape on a small scale by mixing drops of alcohol inks. A summer storm over the roiling ocean provides a moving muse for artist Jen Rork. 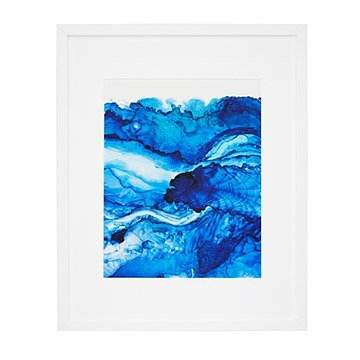 She creates this evocative seascape, along with its companion piece Tidal Shift, on a small scale by mixing drops of alcohol inks on pristine white tiles. She manipulates the pigment using fans, gravity, and by blowing air to create beautiful swirls. She then photographs her miniature masterpieces at the most picturesque moment and blows up the artwork to enhance every plume and undulation in detail. Navy and sky blues intertwine suggesting the churning depths as the rain mixes with the deep. Printed and framed in Portland, Oregon. Over fifteen years ago, Jen Rork started a small design boutique to develop marketing and printed product for art institutions, galleries, and national retailers. Her background in print production gave birth to a small online shop and her return to art-making with paints, inks and pixels. Inspired by interior design, color and subject trends, Jen set about to create a collection of work centered on fun and eclectic imagery. Forms and abstractions from nature are found- agates, surf, and plants- represented by various paints, inks, and post-production editing and color-correction. Her signature oceanscapes are created on white tiles with alcohol inks and are manipulated by the artist via gravity and air. Original impressions are no larger than a playing card but are blown up in scale for dramatic effect. This is a stunning print! I am really happy with this purchase. The colors are vibrant and it's a truly one-of-a-kind piece of art.